—humble leaders who always seek to do better than the status quo. The new National Security Strategy recognizes the critical role of the State Department’s proclaiming that “across the competitive landscape, America’s diplomats are our forward-deployed political capability, advancing and defending America’s interests abroad.” Therefore, to remain relevant and in order to continue to succeed, State’s finest need professional development. Whether to lead peace negotiations or trade talks, combat terrorism or cyberattacks, promote democratic values or defend human rights, engage media or youth, we must ensure that rising officers are knowledgeable of history, well-versed on theory, fluent in current practice and in-tune with future trends. But as they are caught in high-stress jobs with little time to reflect, where should our best talent go to grow their skills and enhance their ability to think critically and lead effectively? The answer is right here in Washington D.C., the National Defense University (NDU) at Fort McNair. Our military has historically recognized the virtue of continuing education through its comprehensive Professional Military Education program. Secretary of Defense Jim Mattis has urged troops to “engage your brain before you engage your weapon.” At NDU, also referred to as “the Chairman’s University” because it falls under the purview of the Chairman of the Joint Chiefs of Staff, the vision is to “create strategic advantage by developing joint warfighters and other national security leaders and forging relationships through whole-of-nations and whole-of-government educational programs, research and engagement.” Thus, it is a logical fit that the best of the best from across U.S. government civilian offices and armed services as well as from our nation’s allies come together at NDU to sharpen their leadership skills, share their experiences and perspectives and develop rela­tionships that will serve them well throughout their careers. In fact, the State Department has enjoyed a long-standing partnership with NDU to produce the next generation of national security leaders—leaders who will serve the nation as superbly as did NDU alumni and National Hall of Fame members former Secretary of State Colin Powell, former National Security Advisor Brent Scowcroft, Ambassador J. Stapleton Roy, Senator John McCain and former Joint Chiefs of Staff Chairman Martin Dempsey. These giants of national security distinguished themselves for their vision, character, drive, sacrifice and service—and all have spoken of their experience at NDU as being seminal to their eventual accomplishments. The State Department has for decades contributed to, and benefitted from, the National Defense University experience by detailing students, faculty and senior leaders, including in positions such as my current one as NDU Senior Vice President. This past December, when new NDU President Vice Admiral Fritz Roegge met with Deputy Secretary of State John Sullivan and Acting Director General Ambassador Bill Todd, they reaffirmed the valuable contributions NDU is making to develop State’s future leaders, stressed their commitment to advancing diversity and gender equality and vowed to further strengthen the ties between our institutions. These meetings are already producing results. NDU is expanding the existing Combatant Command Scholars Program, which has students research, analyze and develop innovative policy options to complex problems, including those that are State Department diplomatic priorities. Furthermore, the State Department is providing additional faculty for the next academic year, thereby ensuring an even deeper bench of experienced practitioners in the line of the renowned diplomat-scholar George Kennan, whose lectures and writings in the 1940s at the National War College laid the foundation for the policy of “containment.” The State Department also has resumed participation in the highly regarded Pinnacle program (for equivalents to three-star military officers) and is looking to do the same with Capstone (for equivalents to newly minted one-star flag officers). And in recognition of State’s contributions to the national security enterprise, NDU is hosting its first-ever Foreign Affairs Day this May. NDU is the nation’s premier graduate-level center for Joint Professional Military Education (JPME) and is accredited to award master’s degrees. The university comprises five colleges: the National War College, the Eisenhower School (formerly the Industrial College of the Armed Forces—ICAF), the College of International Security Affairs (CISA), the College of Information and Cyberspace (CIC) and the Joint Forces Staff College located in Norfolk. In addition, the Institute for National Security Studies is a research arm that also supports NDU’s educational programs. The student body of over 700 in NDU’s master’s degree-awarding programs is diverse. All the U.S. Armed Services are represented, and inter-agency students include nearly 60 from State/USAID. Plus, one-sixth of the students are international fellows who hail from every geographical region, e.g., Afghanistan, Canada, Colombia, India, Kuwait, Uganda and Vietnam, to name a few. To date, more than 3,700 international fellows from 142 countries have attended NDU. The average student is age 43 and has nearly two decades of national security experience, mostly at the tactical and operational levels. The faculty, including senior detailees from across the government, combine traditional academic credentials with deep strategic, operational and tactical practitioner experience in all facets of national security. NDU’s integrated national-security curriculum benefits from keynote lectures from current and former senior officials, such as White House Chief of Staff John Kelly, National Security Advisor H.R. McMaster, Combatant Commanders General Lori Robinson and Admiral Kurt Tidd, former Secretaries of State Henry Kissinger and Condoleezza Rice, Ambassadors Tom Pickering and Johnnie Carson and business leaders Steve Forbes and Ori Brafman. 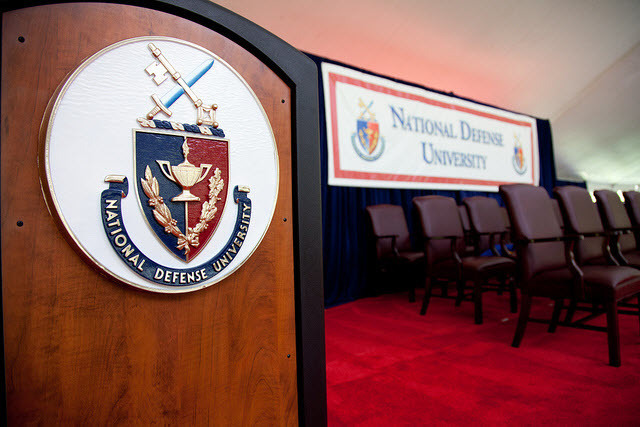 NDU understands what is needed to best serve the common defense. It promotes a whole-of-government effort. It stresses the importance of marshalling inter-agency resources and talent to deliver coordinated policies that yield maximum effect. Furthermore, consistent with the recently released National Security and National Defense Strategies’ calls for the United States to partner with the nation’s allies and others, NDU fosters international col­laboration to confront a multitude of complex challenges and emerging threats. At its core, NDU strives to prepare its students to solve complex/unfamiliar problems, anticipate/adapt to change, operate in unfamiliar areas with unfamiliar partners, act with deep political acumen and develop strong interpersonal and team-building skills. NDU prepares senior leaders to think and operate effectively at the highest levels in an increasingly dynamic, complex and unpredictable international security environment. While each of the five colleges fills a national security niche, all provide strategic leadership development. The National War College, best known for its slew of notable alumni and its historic Roosevelt Hall, concentrates in every course on developing Presidential-level national-security strategy. The Eisenhower School prepares its students, which include some from private industry, for “strategic leadership and success in developing national security strategy and in evaluating, marshaling and managing resources in the execution of that strategy.” Eisenhower students examine the critical nexus with America’s industrial base that is essential for sustaining the nation’s superior defense capabilities. Additionally, its Strategic Leadership Department focuses on personal develop­ment and organizational change management and manages the Executive Assessment and Development Program (EADP). As an extensive multi-instrument, integrated assessment battery, the EADP is used to assess the preferences, capabilities, strengths and weaknesses of NDU students, particularly geared towards the skills they will need to succeed at the strategic level. The College of International Security Affairs, established after 9/11 with a focus on strengthening international networks and building partner capacity to combat terrorism, also delivers a strategic leadership module, as do CIC and the Joint Forces Staff College. The basic tenets taught in the various strategic leadership courses echo the leader­ship and management principles the State Department values: be self-aware, decisive and culturally sensitive; take responsibility; model integrity; value and develop people; com­municate and collaborate; learn and innovate constantly; foster resilience; plan strategically and manage conflict. What NDU provides is precisely what the private sector values. A retired Ambassador who is now a Vice President at one of the top Fortune 500 companies shared with me that the private sector looks to hire former military officers because they know that they are well versed and experienced in ethical leadership. Another foreign CEO recently highlighted the value to Silicon Valley of the strategic planning and forecasting that is a core component of an NDU education. While Foreign Service Officers’ Employee Evaluation Reports may frequently describe an officer as a “natural born leader,” the reality is that most effective senior leaders are developed through coaching and mentorship—which is available at NDU. The State Department greatly benefits from being part of NDU, not only because its officers return better prepared to take on increasingly higher levels of responsibility, but also because their contributions in seminars with a wide cross-section of military, inter-agency and international officers ultimately means that they will better appreciate the role of diplomacy and the value added by the Foreign and Civil Service. Most military officers have had little exposure to the State Department and our embassies prior to coming to NDU and therefore have misperceptions about its size and resources. During my year at the National War College, a commonly cited factoid was that “there were more members of military marching bands than Foreign Service officers,” and most students were surprised to learn that our budget amounted to roughly one percent of the Federal budget. Through seminar dis­cussions, the military officers and interagency colleagues better understand our limita­tions and grow to respect—even admire—our contributions. Each year the State Department identifies top talent to send to NDU, but unfortunately a notion persists among some that a year away from the “mothership” is detrimental to one’s career and they therefore opt not to attend even if selected. Rest assured, NDU is no year off; it is an intense academic year dedicated to professional growth, personal wellness and reflection. An NDU degree not only provides one with critical leadership skills and a broader inter-agency and international network, but it also delivers instant credibility with Department of Defense and military colleagues, thereby making the officer a more effective partner as she/he rises and serves with our defense counterparts in the field. It has paid dividends for scores of Ambassadors, including Wanda Nesbitt, Don Yamamoto, Marie Yovanovitch, Bill Brownfield, Joyce Barr, Glyn Davies, Makila James, Lynn Pascoe, Janice Jacobs, Ron Neumann, Julieta Noyes, Stephanie Sullivan and Peter Vrooman. Therefore, senior leaders need to continue coming to NDU to share the wealth of their experience, even though it can be challenging at times to get the State Department’s leadership to carve time out of their busy schedules. No investment the Department makes is more important than preparing its future leaders—leaders who will advance America’s values and interests abroad and keep our citizens safe at home. Upon her recent retirement, former NDU Senior Vice President Ambassador Nancy McEldowney captured well how most of us in leadership and teaching positions at NDU feel when she noted, “Of all the things I have done in my 30-year career in public life, including serving as an Ambassador overseas and as a policy advisor in the White House, it is this work supporting the next generation of government employees that I am most proud of.” Bottom line: the NDU-State relationship is a win-win-win; it delivers for both institutions and for the nation.